Warning: Lots of ugly creatures appear in this film, lots of people (and creatures) die in extended battles, severed heads are shot back at their countrymen, a finger is bitten off, flying dragons pick up horses and men and throw them down to their deaths, and one of the dragons has its head cut off; you see dead people (ghosts) who are not dead, and you’ll see a battle with a huge, evil spider. Therefore, this movie is not for people with a weak stomach or who don’t like war movies! The story is quite complicated, but it will help if you can remember the different names each person has! Some students say it is very helpful to print this list of characters! Denethor: caretaker or steward of Gondor’s throne—acting as governor while they wait for the king to return; he goes crazy under all the pressure after learning that his son Boromir is dead (see film 1). Orcs: evil, ugly creatures, created at Sauron’s command to be his army. Arwen: an elf princess and Aragorn’s fiancé (against her father’s will); after deciding to obey her father, she sees a vision of the son she might have if she marries the human Aragorn. Even swords have names and unique properties! Narsil was the broken sword that Isildur (Aragorn’s ancestor) used to cut the ring off Sauron’s hand; the re-forged blade is called Anduril, and it is given to Aragorn, Isildur’s heir. Frodo’s small sword is called Sting, and it glows blue when there are Orcs nearby. horn: an instrument (originally made from an animal’s horn) used to warn others (esp. an army), or to play music. The story centers on a “ring of power,” which had been created by an evil creature (Sauron) to give himself power over all Middle Earth. The evil ring makes the wearer invisible, heightens his senses, and also stops the aging process for its owner; in Sauron’s hands it also had vast destructive power. Centuries before, in a great battle, a human king (Isildur) cut the ring off Sauron’s hand. He should have destroyed the ring by throwing the evil thing into a volcano (Mount Doom), but he “was weak” and decided to keep the ring (hoping that he could use its power to rule). His descendants, and all the creatures of Middle Earth, have suffered ever since. Then the ring was lost, and many years later it was accidentally found by a Hobbit, and another Hobbit (Smeagol) murdered the finder and stole the “precious” ring (you see this as a flashback at the beginning of movie #3). Years later, Smeagol loses the ring, and another Hobbit finds it (Bilbo Baggins). This is the subject of an earlier book by JR Tolkien (The Hobbit). A good wizard (Gandalf) figures out that this is the long-missing evil ring. He and other “wise” creatures (men, elves, a dwarf) won’t even touch it, fearing that they cannot resist its evil power. But the race of Hobbits are simple folk who are very humble. Bilbo doesn’t seem to be affected by the ring’s evil power, and when he is old he gives the ring to his nephew (Frodo Baggins). At this point, the evil power of the ring “wakes up,” and a council of wise leaders decides to let Frodo try to destroy the ring in Mount Doom—with the help of eight brave companions (the Fellowship of the Ring; movie #1). Of course, evil Sauron (who does not know about the plan/attempt to destroy his ring) wants it back so he can rule Middle Earth. He, too, has helpers—an army of evil creatures, Nazgul & Orcs (see “People and proper nouns” above), a bad wizard, evil men, pirates, mercenaries, etc. Frodo doesn’t have much hope of succeeding in his task, but the “good” folks of Middle Earth really don’t have much choice. They must let him try. So, the story is about Frodo trying to get to the volcano to destroy the ring, while Sauron and his evil army try to destroy Middle Earth (and if possible, capture the ring too). Isildur’s heir (Aragorn) is the rightful king of one of the countries in Middle Earth, but because his ancestor chose not to destroy the ring, the family has been hiding in shame (and Aragorn is afraid that he would be just as self-centered as his ancestor). Meanwhile, the people wait for the “return of the king”—who they hope will free them from Sauron’s evil power and bring peace to Middle Earth. In the third film, Sauron gathers a vast army to attack the humans; Aragorn and Gandalf also put together an army of men, elves and “undead” warriors (men who promised to help Aragorn’s ancestors but didn’t, and were cursed with an inability to “rest in peace”). The story moves back and forth between these armies/people and Frodo (with Sam and Gollum), on their quest to destroy the ring in Mt. Doom. Aragorn is in love with an elf princess (Arwen), and she loves him so much that she is willing to give up her elfish immortality to become his wife. (This does not make her father, the elf lord, very happy!) Most of the love story is in the first two movies. Mixed into this story are smaller stories about friendship, sacrifice, love, power, fear, hope, leadership, shame, good vs. evil, the deep influence “evil” has to make “good” creatures into “bad” creatures, and the equally great power that self-less acts of “goodness” have to change the lives of others. There are a lot of words that don’t really mean anything (or are no longer used), but you can tell by the actors’ tone of voice that they are there for their derogatory value (i.e., to show criticism or displeasure). There are some Old English words (that aren’t used much anymore): e.g., forth=forward, ere=before, nought but=in nothing except, aye=yes, my old Gaffer=an old man or boss, or possible father? From time to time they quote prophecies about what would happen one day. Gollum uses non-standard English (like someone who has forgotten his mother tongue), so don’t try to “learn English” from Gollum! E.g., he says “Orcses” instead of “Orcs” as the plural of “Orc,” and he misuses verb tenses. Perhaps the author does this because he wants us to pity Gollum. Remember that he owned the ring for a long time, and his life is “bound” to the ring’s evil power. Remember that Frodo and Sam (Frodo’s best friend) don’t know what is going on with Aragorn and the people with him. They went in separate directions at the end of the first movie. Frodo thinks that Gandalf is dead, so their reunion at the end is a big surprise. You also see Frodo’s uncle Bilbo Baggins at the end (he is about 125 years old). Knowing that the ring is totally evil and has a “will of its own,” would you (like Frodo) have volunteered to take it into the enemy’s camp to try to destroy it? Would you (like Sam) have stayed with Frodo, even after he told you to go away? What would you (like Pippin) have said to the father of the man who died to save your life? Would you (like Aragorn) have risked your life to go see the “dead” army, seeing that you desperately needed extra help? Would you have risked the destruction of your army to “give Frodo a chance”–even though you weren’t sure he was still alive? Would you, like Gondor’s caretaker Denethor, have told everyone to “abandon your posts and flee for your lives” when your situation looked hopeless? Like Arwen, would you have given up “immortality” to marry a human for the sake of love, even if you knew it meant living alone for centuries after he died? The description above says this movie is about friends who “are engaged in a classic struggle between good and evil, and more importantly, the struggle we each face in doing what is right for our friends, our countrymen, and ourselves.” Explain that description, using examples from the movie. Why is history filled with “the struggle between good and evil”? Where do you think that “good” and “evil” come from? Many people think this is a fundamental question, and the answer deeply affects the purpose of our existence. Do you agree? Why or why not? Deagol: Smeagol, I’ve got one! I’ve got a fish, Smeagol. Smeagol! 2. Smeagol: Give us that [ring], Deagol my love. 3. Gollum: They cursed us. “Murderer” they called us. They cursed us, and drove us away. And we wept, Precious; we wept to be so alone. And we only wish to catch fish so juicy sweet. And we forgot the taste of bread… the sound of trees… the softness of the wind. We even forgot our own name. My Precious. 4. Gollum: Wake up. Wake up. Wake up, sleepies. We must go; yes, we must go at once. Sam: Haven’t you had any sleep, Mr. Frodo? [Frodo shakes his head] I’ve gone and had too much… it must be getting late. Frodo: No, it isn’t. It isn’t midday, yet. The days are growing darker. Sam: Not before Mr. Frodo’s had something to eat. Sam: [Gives Frodo lembas] Here, eat this. Sam: Oh, no, I’m not hungry. Leastways, not for lembas bread. Sam: All right… we don’t have that much left. We have to be careful, we don’t want to run out. You go ahead and eat that, Mr. Frodo. I’ve rationed it… there should be enough. Pippin: I feel like I’m back at the Green Dragon, after a hard day’s work. Gimli: You young rascals! A merry hunt you’ve led us on, and now we find you… feasting and… and smoking. Pippin: We are sitting on a field of victory enjoying a few well-earned comforts. [Merry blows a smoke ring] The salted pork is particularly good. Merry: We’re under orders from Treebeard, who has taken over management of Isengard. Treebeard: [as they walk toward the tower] Young Master Gandalf! I’m glad you’ve come. Wood and water, stock and stone I can master, but there’s a wizard to manage here, locked in his tower. Gandalf: And there Saruman must remain, under your guard, Treebeard. Gandalf: Your treachary has already cost many lives. Thousands more are now at risk, but you could save them Saruman. You were deep in the enemy’s council. Saruman: So you have come here for information. I have some for you. [he reveals his Palantir] Something festers in the heart of Middle-Earth. Something that you have failed to see. But the Great Eye has seen it. Even now he presses his advantage. His attack will come soon. You’re all going to die. But you know this don’t you, Gandalf? [sneering] You cannot think that this Ranger will ever sit upon the throne of Gondor. This exile, crept from the shadows, will never be crowned king. Gandalf does not hesitate to sacrifice those closest to him, those he professes to love. Tell me… what words of comfort did you give the halfling before you sent him to his doom? The path that you have set him on can only lead to death. 6. Theoden: Tonight we remember those who gave their blood to defend this country. Hail the victorious dead. King Theoden: [to his daughter Eowyn] I am happy for you. He is an honorable man. Theoden: It was not Theoden of Rohan who led our people to victory. Ah, don’t listen to me. You are young, and tonight is for you. Merry, Pippin [singing]: You can search far and wide. You can drink the whole town dry. But you’ll never find a beer so brown as the one we drink in our hometown. You can drink your fancy ales. You can drink them by the flagon. But the only brew for the brave and true… comes from the Green Dragon! Gandalf: There is no word of Frodo. Gandalf: That Frodo is alive. Yes. Yes, he’s alive. Smeagol: We want to see them dead. Gollum: Smeagol did it once [murder sb], Smeagol can do it again. It’s ours! Smeagol: We must get it back. Smeagol: We lead them to the winding stairs…until we come to the tunnel. Gollum: She’s always hungry. She always needs to feed. She must eat. All she gets is filthy Orcses. Smeagol: And they doesn’t taste very nice, does they, Precious? Smeagol: …and take it for ME. Smeagol: Yes, we meant “for us”. The Precious will be ours, once the Hobbits are dead! Sam (who overheard the end of Gollum’s plan; comes and hits Gollum): You treacherous little toad! Frodo (wakes up and comes to save Gollum): Sam, leave him alone! Sam: I heard it from his own mouth. He means to murder us. Gollum: Never! Smeagol wouldn’t hurt a fly! He’s a horrid Hobbit, who makes up nasty lies. Sam: You miserable little maggot. I’ll stove your head in! Frodo: If you scare him off, we’re lost! Sam: I don’t care! I can’t do it, Mr. Frodo. I won’t wait around for him to kill us. Frodo: I’m not sending him away. Sam: [about Gollum] You don’t see it, do you? He’s a villain. Frodo: We can’t do this by ourselves, Sam. Not without a guide. I need you on my side. Sam: I am on your side, Mr Frodo. 9. Legolas: The stars are veiled. Something stirs in the East. A sleepless malice. The eye of the enemy is moving. Pippin: I saw… I saw him. I can hear his voice in my head. Gandalf: There was no lie in Pippin’s eyes. A fool… but an honest fool, he remains. He told Sauron nothing of the Ring. We’ve been strangely fortunate. Pippin saw in the Palantir a glimpse of the enemy’s plan. Sauron moves to strike the city of Minas Tirith…. If the beacons of Gondor are lit, Rohan must be ready for war. Gandalf: I ride for Minas Tirith… [looks at Pippin] …and I won’t be going alone. [scene moves outside] Of all the inquisitive Hobbits, Peregrin Took, you are the worst. Hurry! Pippin: I don’t know. I can’t help it. Pippin: I’m sorry, all right? I won’t do it again. Merry: Don’t you understand? The enemy thinks you have the Ring. He’s going to be looking for you, Pip. They have to get you out of here. Pippin: And you… you’re coming with me? [Merry impatiently walks away] Merry? Gandalf: Three days’ ride, as the Nazgul flies, and you’d better hope we don’t have one of those on our tail. Merry: I know you’ve run out. You smoke too much, Pip. Pippin: But we’ll see each other soon. Won’t we? Merry: I don’t know. I don’t know what is going to happen. Arwen [to her father]: Tell me what you have seen. You have the gift of foresight. What did you see? Arwen: But there is also life. You saw there was a child, you saw my son! Arwen: Some things are certain. If I leave him now, I will regret it forever. It is time. [scene shifts, showing craftsmen fixing the broken blade that killed Sauron, while Arwen quotes a prophecy] “From the ashes, a fire shall be woken. A light from the shadow shall spring. Renewed shall be blade that was broken. The crownless again shall be king.” [then she turns to her father] Reforge the sword. Arwen: This was my choice… Whether by your will or not, there is no ship now that can bear me hence. Pippin: It’s the tree. Gandalf! Gandalf! Denethor: Perhaps you’ve come to explain this [his son’s broken horn]…. Pippin: Boromir died to save us. He fell defending us from many foes. [kneeling] I offer you my service, such as it is, in payment of this debt. Pippin: The mightiest man may be slain by one arrow… and Boromir was pierced by many. Gandalf: Get up. My Lord, there will be a time to grieve for Boromir, but it is not now. War is coming. The enemy is on your doorstep. As steward, you are charged with the defense of this city. Where are Gondor’s armies? You still have friends. You are not alone in this fight. Send word to Theoden of Rohan. Light the Beacons. Gandalf: Authority is not given to you to deny the return of the king, Steward. Denethor: The rule of Gondor is mine! And no other’s! 12. Pippin: [pulls sword from scabbard] So I imagine this is just a… ceremonial position? I mean, they don’t actually expect me to do any fighting… Do they? Gandalf: You’re in the service of the Steward now. You’ll have to do as you’re told, Peregrin Took. [shakes his head] Guard of the Citadel. Pippin: I don’t want to be in a battle. But waiting on the edge of one I can’t escape is even worse. Is there any hope, Gandalf, for Frodo and Sam? Pippin: But we have the White Wizard. That’s got to count for something. 13. Sam: [Frodo is being drawn toward the “dead city” Cirith Ungol] No, Mr. Frodo! Gollum: [in a panic] Not that way! Oh! What’s he doing? 14. Gandalf: We come to it, at last. The great battle of our time… The board is set… the pieces are moving. Gandalf [rushing off toward the beacon towers]: Peregrin Took, there is a task now to be done. Another opportunity for one of the Shirefolk to prove their great worth. You must not fail me. 15. Gondorian Soldier 1: The Beacon! The Beacon of Amon Din is lit. 16. Aragorn: The Beacons of Minas Tirith! The Beacons are lit! Gondor calls for aid. Theoden: And Rohan will answer. Muster the Rohirrim. Assemble the army at Dunharrow. As many men as can be found. You have two days. On the third, we ride for Gondor… and war. Eomer [to his soldiers]: Now is the hour! Riders of Rohan! Oaths you have taken. Now, fulfill them all. To lord and land! 17. Gothmog: The Age of Men is over. The Time of the Orc has come. 18. Faramir: Mithrandir! They broke through our defenses! They’ve taken the bridge and the west bank. Battalions of Orcs are crossing the river. Pippin: You’ve seen Frodo and Sam? Faramir: In Ithilien. Not two days ago. Gandalf, they’re taking the road to the Morgul Vale. Pippin: What does that mean? What’s wrong? 19. Pippin: Here do I swear fealty [loyalty to a king] and service to Gondor. In peace or war. In living or dying. From this hour henceforth, until my lord release me… or death take me. 20. Denethor: Is there a captain here who still has the courage to do his lord’s will? Denethor: Yes. [whispering] I wish that. Faramir: Since you are robbed of Boromir… I will do what I can in his stead. [Bows and turns to leave] If I should return, think better of me, Father. Pippin: I didn’t think they would find any livery that would fit me. Pippin: This [uniform] was yours? Faramir: Never fitted me either. Boromir was always the soldier. They were so alike, he and my father. Proud… stubborn, even. But strong. 21. Sam: What are you up to? Sneaking off, are we? Gollum (sarcastically): Sneaking? Sneaking? Fat Hobbit is always so polite. Smeagol shows them secret ways that nobody else could find, and they say “sneak!” Sneak? Very nice friend. Oh, yes, my precious. Very nice, very nice. Sam: Fine, have it your own way. I’m sorry to wake you Mr Frodo, we have to be moving on. Sam: It’s always dark here. [he looks for their only food in his bag] It’s gone! The elven bread! Frodo: What? That’s all we have left. Gollum: Smeagol? Oh no, not poor Smeagol. Smeagol hates nasty elf bread. Sam: You’re a lying wretch. What did you do with it? Frodo: He doesn’t eat it. He can’t have taken it. Gollum: Look. What’s this? Crumbs on his jacketses. He took it! He took it! I seen him. Frodo: Sam! Stop it. Sam, no! Sam: Oh my! I’m sorry. I didn’t mean it to go so far I was just so, so angry. Here, let’s just rest a bit. Sam: I don’t want to keep it. I just want to help. Sam: Shut-up you! Go away. Get out of here! Frodo: No Sam, it’s you. I’m sorry Sam. Sam: But he’s a liar. He’s poisoned you against me. Frodo: You can’t help me anymore. Sam: You don’t mean that. 22. Gandalf: Faramir! [Running after Faramir] Your father’s will has turned to madness. Do not throw away your life so rashly. 23. Denethor: Can you sing, Master Hobbit? Pippin: Well… yes. At least, well enough for my own people. But we have no songs for great halls and… evil times. Pippin: [singing to Denethor as Faramir leads the doomed, suicidal attack] Home is behind, the world ahead… and there are many paths to tread… Through shadow… To the edge of night… Until the stars are all alight… Mist and shadow, cloud and shade… All shall fade… all… shall… fade. Theoden (quietly to Aragorn): Six thousand spears. Less than half of what I’d hoped for. Aragorn: Every hour lost hastens Gondor’s defeat. We have till dawn, then we must ride. Eomer: They grow restless in the shadow of the mountain. Gimli: That road there… where does that lead? Gimli: Aragorn, let’s find some food. Elrond: You ride to war, but not to victory. Sauron’s armies march on Minas Tirith, this you know. But in secret he sends another force which will attack from the river. A fleet of Corsair ships sails from the south. They reach the city in two days. Elrond: You’re outnumbered, Aragorn. You need more men. Elrond: They will answer to the king of Gondor. [He pulls out Anduril.] Anduril, Flame of the West, forged from the shards of Narsil. Eowyn: Why are you doing this? The war lies to the East. You cannot leave on the eve of battle. You cannot abandon the men. Gimli: Where do you think you’re going? Legolas [walks up to them, leading his horse]: Have you learned nothing of the stubbornness of Dwarves? Gimli: You may as well accept it. We’re going with you, laddy. 27. Theoden [to his daughter]: I have left instruction. The people are to follow your rule in my stead. Take up my seat in the Golden Hall. Long may you defend Edoras if the battle goes ill.
Theoden: Duty? No… I would have you smile again, not grieve for those whose time has come. You shall live to see these days renewed. No more despair. 28. Gimli: What kind of army would linger in such a place? Legolas: One that is cursed. Long ago the men of the mountain swore an oath to the last king of Gondor, to come to his aid, to fight. But when the time came, when Gondor’s need was dire, they fled, vanishing into the darkness of the mountain. And so Isildur cursed them, never to rest until they had fulfilled their pledge. Who shall call them from the gray twilight, the forgotten people? Aragorn [after the horses run away in panic]: I do not fear death. Gimli [in fear, after Aragorn and Legolas go into the cursed mountain]: Well, this is a thing unheard of. An Elf would go underground, where a Dwarf dare not. Oh, I’d never hear the end of it. 28b. Eowyn [picking Merry up, after the king said he cannot go to the battle]: Ride with me. 29. King of the Dead: The dead do not suffer the living to pass. King of the Dead: The way is shut. It was made by those who are dead, and the dead keep it. The way is shut. Now you must die. Aragorn [takes him by the throat]: It has been remade. [Aragorn releases the King of the Dead; and turns to his army.] Fight for us… and regain your honor. What say you? What say you? Gimli: You’re wasting your time. They had no honor in life. They have none now in death. Aragorn: I am Isildur’s heir. Fight for me. And I will hold your oaths fulfilled. What say you? 30. Gothmog: [sniffs] Fear. The city is rank with it. Let us ease their pain. Release the prisoners! Denethor [believing that Faromir is dead, though Pippin finds out that he is just badly injured]: My sons are spent. My line has ended… Rohan has deserted us. Theoden’s betrayed me. [to his army] Abandon your posts! Flee, flee for your lives! Gandalf [to the soldiers]: Prepare for battle! …Hold them back! Do not give in to fear! Stand to your posts! FIGHT! …Send these foul beasts into the abyss. … Not at the towers! Aim for the trolls! Kill the trolls! Bring them down! Gandalf: Peregrin Took! Go back to the Citadel! Frodo: Now that I’m here, I don’t think I want to. Frodo: I have to destroy it [the ring], Smeagol. I have to destroy it for both our sakes. A1. Denethor: No tomb for Denethor and Faramir. No long, slow sleep of death embalmed. We shall burn, like the heathen kings of old. Bring wood and oil. A2. Denethor: Why do the fools fly? Better to die sooner than late. For die we must. A3. Denethor: I am the servant of the house of Anarion. Thus I have walked… thus now I will sleep. A4. Denethor [talking about his son, who he thinks is dead and thus sets on fire]: He is burning… already burning. Pippin: He’s not dead! He’s not dead! [Denethor drags Pippin out] No! No! He’s not dead! Stop! Denethor: Farewell, Peregrin, son of Paladin… I release you from my service. Go now and die in what way seems best to you. A7. Sam: [to Shelob] Let him go, you filth. Let him go! You will not touch him again! A8. Sam: [tearing the spider silk away from Frodo’s face] Oh no! Frodo… Mr. Frodo, wake up… Don’t leave me here alone. Don’t go where I can’t follow… Wake up. A9. Gorbag: [as he and another Orc, Shagrat, come upon Frodo’s lifeless body] What’s this? Looks like old Shelob has been having a bit of fun. Gorbag: [he examines Frodo’s body] No… this fellow ain’t dead. Gorbag: And then he’ll wish he’d never been born. A10. Aragorn: [to the corsair ships] You may go no further! You will not enter Gondor. Aragorn: Legolas, fire a warning shot past the bosun’s ear. Gimli: Oh! That’s it, right! We warned you! Prepare to be boarded! Captain [laughing]: Boarded! By you and whose army? A11. Elrond (to his daughter): You gave away your life’s grace. I cannot protect you anymore. A12. Gimli: There’s plenty for the both of us, may the best Dwarf win. Gorbag: I’m gonna bleed you like a stuck pig. Sam: Not if I stick you first. [as he kills the three Orcs guarding Frodo] That’s for Frodo! And for the Shire! And that’s for my old Gaffer! A15. Sam: You can’t go walking through Mordor in naught but your skin. A16. Sam: [Frodo stops walking] Mr. Frodo? What is it? Frodo: Just a thought… I don’t think I’m going to be returning. Frodo: There’ll be none left for the return journey. Sam: I don’t think there will be a return journey, Mr. Frodo. A18. Theoden: Eomer. Take your Èored down the left flank. Gamling, follow the King’s banner down the center. Grimbold, take your company right, after you pass the wall. Forth, and fear no darkness! Arise! Arise, Riders of Theoden! Spears shall be shaken, shields shall be splintered! A sword day… a red day… ere the sun rises! Eowyn: [to Merry] Whatever happens, stay with me. I’ll look after you. Theoden: Ride now!… Ride now!… Ride! Ride to ruin and the world’s ending! [He stops and faces Sauron’s army, and shouts…] Death! A19. Witch King: Send forth all legions. Do not stop the attack until the city is taken. Slay them all. A20. Gimli [recalling that dwarves and elves have always been enemies]: Never thought I’d die fighting side by side with an Elf. A22. Gandalf: Go back to the abyss! Fall into nothingness that awaits you and your master! A23. Witch King: Feast on his flesh. Witch King: Do not come between the Nazgul and his prey. [taking Eowyn by the throat] You fool. No man can kill me. Die now. A24. Theoden: I know your face… Eowyn. My eyes darken. Eowyn: No. No. I’m going to save you. A25. Merry: Are you going to leave me? A26. King of the Dead [after the battle]: Release us. Gimli: Bad idea. Very handy in a tight spot, these lads, despite the fact they’re dead. Aragorn [consenting]: I hold your oaths fulfilled. A27. Gandalf: Frodo has passed beyond my sight. The darkness is deepening. Gandalf: It’s only a matter of time. A28. Gandalf: He’s suffered a defeat, yes, but… behind the walls of Mordor, our enemy is regrouping. 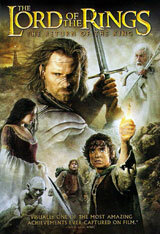 Gandalf: Because ten-thousand Orcs now stand between Frodo and Mount Doom. I’ve sent him to his death. Aragorn: No. There is still hope for Frodo. He needs time… and safe passage across the plains of Gorgoroth. We can give him that. Aragorn: Draw out Sauron’s armies. Empty his lands. Then we gather our full strength and march on the Black Gate. Aragorn: Not for ourselves. But we can give Frodo his chance if we keep Sauron’s Eye fixed upon us. Keep him blind to all else that moves. A29. Sam [both are overcome by exhaustion]: Do you remember the Shire, Mr. Frodo? It’ll be spring soon. And the orchards will be in blossom. And the birds will be nesting in the hazel thicket. And they’ll be sowing the summer barley in the lower fields… and eating the first of the strawberries with cream. Do you remember the taste of strawberries? Smeagol: Mustn’t go that way! Mustn’t hurt the Precious! A31. Aragorn: Let the Lord of the Black Land come forth! Let justice be done upon him! Sauron’s spokeman: My master, Sauron the Great, bids thee welcome. Is there any in this rout with authority to treat with me? Sauron’s spokeman: Ahh, old Greybeard. I have a token I was bidden to show thee. Sauron’s spokeman: The halfling was dear to thee, I see. Know that he suffered greatly at the hands of his host. Who would’ve thought one so small could endure so much pain? And he did, Gandalf, he did. Aragorn: [to Gandalf, regarding the supposed death of Frodo] I do not believe it! I will not! A34. Aragorn: Hold your ground, hold your ground! Sons of Gondor, of Rohan, my brothers! I see in your eyes the same fear that would take the heart of me. A day may come when the courage of men fails, when we forsake our friends and break all bonds of fellowship, but it is not this day. An hour of woes and shattered shields, when the age of men comes crashing down! But it is not this day! This day we fight! By all that you hold dear on this good Earth, I bid you stand, Men of the West! A36. Merry: [triumphantly, as Barad-Dur crumbles] Frodo! Frodo! A37. Sam: Give me your hand. Take my hand. Don’t you let go. Don’t let go… Reach! A38. Frodo: [after destroying the Ring, but realizing that they cannot escape the volcano] I can see the Shire. The Brandywine River. Bag End. The Lights in the Party Tree. Frodo: [leans over and hugs him] I’m glad to be with you, Samwise Gamgee, here at the end of all things. A40. Gandalf: Now come the days of the King! [whispers] May they be blessed. A41. Aragorn: [to Frodo, Sam, Pippin, and Merry] My friends. You bow to no one. A42. Frodo: [voiceover] And thus it was. A fourth age of middle-earth began. And the fellowship of the ring… though eternally bound by friendship and love… was ended. Thirteen months to the day since Gandalf sent us on our long journey… we found ourselves looking upon a familiar sight. We were home. How do you pick up the threads of an old life? How do you go on… when in your heart you begin to understand… there is no going back? There are some things that time cannot mend… some hurts that go too deep… that have taken hold. Bilbo once told me his part in this tale would end… that each of us must come and go in the telling. Bilbo’s story was now over. There would be no more journeys for him… save one. My dear Sam. You cannot always be torn in two. You will have to be one and whole for many years. You have so much to enjoy and to be and to do. Your part in the story will go on. A43. Sam: [reading the book’s title] “There and Back Again: A Hobbit’s Tale” by Bilbo Baggins, and “The Lord of the Rings” by Frodo Baggins. You finished it! Frodo: Not quite. There’s room for a little more. A44. Bilbo: Tell me again, lad… where are we going? Bilbo: Frodo… Any chance of seeing that old ring again? Hmm? The one I gave you? Frodo: I’m sorry, uncle… I’m afraid I lost it. Bilbo: Oh… Pity. Should have liked to have held it one last time. A45. Galadriel: The power of the Three Rings is ended. The time has come… for the dominion of Men. Bilbo: I think I’m… quite ready for another adventure. Gandalf: Farewell… my brave Hobbits. My work is now finished. Here at last, on the shores of the sea… comes the end of our Fellowship. I will not say, “Do not weep…”; not all tears are an evil. Sam: [weeping] You don’t mean that. You can’t leave.